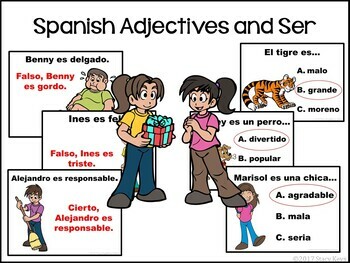 This Spanish adjectives powerpoint may serve as a class warm up or cool down, or function as a review for a test. There are 52 slides allowing you to use this practice over several days and in different ways! Includes the following adjectives: aburrido, alto, antipatico, artistico, atletico, bajo, bonito, bueno, comico, delgado, divertido, extrovertido, feo, generoso, gordo, grande, inteligente, joven, largo, malo, moreno, pesado, perezoso, pequeno, pobre, rico, rubio, serio, simpatico, timido, tonto, trabajador, viejo. Slide 2: The verb ser (no mouse-click). 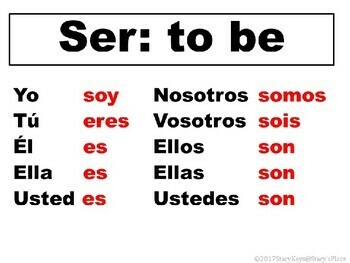 Slides 4 - 12: Fill in the blank with the correct form of the verb "ser". Slides 14 - 42: Choose the correct adjective. Slides 44 - 53: Cierto o Falso. True or False. There is a slide with directions provided at the beginning of each section.